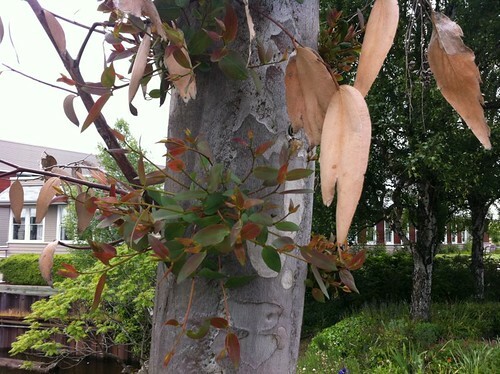 A cold-damaged eucalyptus tree in Eastlake’s Hamlin street end that was given a professional pruning last summer in an effort to save it is showing a few signs of new growth. The bits of growth are coming amidst mostly brown leaves hanging off the tree. 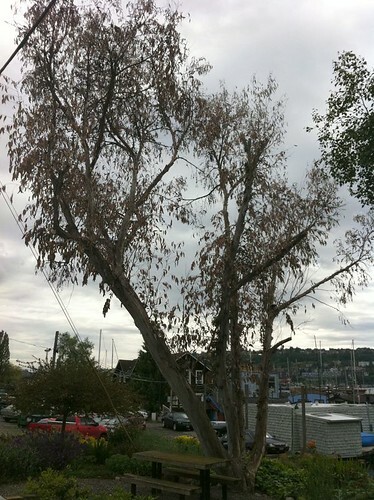 Joshua Erickson, an arborist with the City of Seattle, says that the growth on the trunk, while it may look encouraging, is a sign of stress. The professional tree pruner who worked on the tree last August reached the same conclusion. Erickson said he’ll inspect the tree to see how it’s doing and what the next steps might be. The city had said last year that it would replace the tree if it needs to be removed. Ruth Kunath and April Boyd, who both live near the tree, raised money from 19 neighbors last year to pay to get the tree pruned in an effort to save it. In an email, Kunath said the ultimate decision on the tree’s fate rests with the city. Kunath said she had solicited ideas for a replacement tree last year. Those included liquidambar, katsura, dogwood, magnolia or anything with ”dappled shade.” She isn’t sure what trees the city has in its tree inventory. This entry was posted in Uncategorized on June 6, 2011 by cdmilton.